It’s the first time that China has officially informed downstream countries about its water discharge even though 20 years have elapsed since the first of their six dams on the Mekong started operating. China was praised by Thai leaders for its generosity. But for Mr Chai and his vendor friends, the announcement created little excitement. The river shore flooded just like in other years when China released water without giving any notification. Many Thai communities located along the Mekong believed this year’s announcement is simply to curry diplomatic favour with countries who rely on the river. On March 14, an official from the Chinese Embassy visited the Ministry of Foreign Affairs to inform them China will release water from the Jinghong hydropower station in Yunnan province from March 15 to April 10 to relieve downstream drought. About 2,000 cubic metres (two megalitres) of water would be discharged every second, double the normal rate. The MFA quoted China as saying the Mekong sub-region countries faced their lowest water levels in 100 years. Yunnan is facing a similar problem. The water level in the Lancang River, upstream from the Mekong, has declined 20% this year and is at its lowest in 90 years. Despite Chinese territory covering a fifth of the Mekong it has used only 4% of the water from the Lancang. China claims that its dams enhance water management and allow water to be fed to downstream countries. “China and the Mekong River countries … are friendly neighbours. People living along the Lancang-Mekong River are nourished by the same river,” China’s Foreign Ministry spokesperson Lu Kang said earlier this month. “It goes without saying that friends should help each other when help is needed. Vietnam is facing its worst drought since 1926, with the country’s main rice-growing region facing water shortages and saline intrusion. State media quoted a government report as saying some 575,000 people were short of fresh water, with damage to some 180,000 hectares of paddy fields. Thai Prime Minister Gen Prayut Chan-o-cha said China’s release of the extra water was the result of the good relationship between the two countries. The Royal Irrigation Department said China’s water discharge will help Thais pump water from the Mekong River to help northeastern farmers. Mr Chai is less convinced about China’s generous gesture. In the past he was occasionally informed by his friends about water discharges from Chinese dams. They usually received the information second-hand from transport vessels shipping goods from the lower Mekong to China. “None of the Thai leaders have raised the problem about water flow changes to China seriously,” said Mr Chai, who has protested against the building of Chinese dams for a decade. Water levels in the Mekong rise and fall naturally during the rainy and dry seasons. But Mr Chai said after the six Chinese dams were built upstream, the water levels have changed far more rapidly in the same season. Chiang Khan residents have become accustomed to the natural changes in the water level over the years and are used to quickly packing up and removing their stalls. According to the Mekong River Commission’s website, the water discharge rate recorded at Chiang Saen station in Chiang Rai — the first Thai province to meet the Mekong River downstream from Jinghong dam — was nearly 2,500 cubic metres per second in the middle of March 2014. This is 25% higher than the rate in the middle of this month, which was 2,000 cubic metres per second. The water level on March 16, 2014 was 3.43m compared to 3.28m this year. The record for the discharge rate in March last year is close to that recorded this year, indicating the Jinghong dam has previously released water at a rate higher or similar to that trumpeted in its recent announcement. During the dry season, water discharge is usually constant as China has to maintain a reasonable level to allow river traffic while also freeing up space in the dam in anticipation of it being filled during the rainy season. 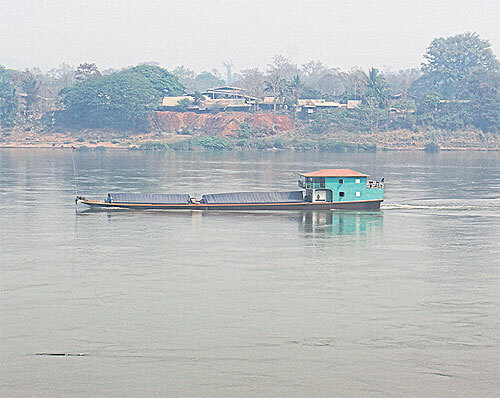 In January, boat captains in Chiang Saen complained about low levels in the Mekong, forcing them to reduce shiploads from 400 tonnes to 200 tonnes to allow a vessel safe passage to China. Since the recent water discharge, ships have been able to carry full loads. After being pressured by Mekong countries, in 2009 China started providing data about water levels in the Jinghong dam for the period between June and October. But the data only related to the wet season and showed dam levels and not water-flow rates. Vorasakdi Mahatdhanobol, director of the Chinese Studies Centre at Chulalongkorn University’s Institute of Asian Studies, agreed the Chinese announcement was simply a case of diplomacy. He said the announcement was most likely aimed at Vietnam, whose leaders have attacked Beijing for the worsening water problem in the Mekong delta. “I don’t think the water discharge will tighten Chinese relationships with lower Mekong countries,” he told Spectrum. Thai leaders are not in a position to raise problems caused downstream by the six Chinese dams — Dachaoshan, Manwan, Jinghong, Xiaowan, Nuozhadu and Gongguoqiao — as a Thai company played an early role in developing the projects. In 1988, Thailand’s GMS Power Company and China’s Huaneng Group signed an MoU to cooperate in hydropower development. GMS expressed interest in two projects, the Nuozhadu and Junghong dams. Another MoU was signed in 2000 by the GMS Power and the Yunnan electricity bureau to develop the Jinghong dam with some of the power generated going to northern Thailand. GMS later pulled out of the agreement amid unconfirmed reports of financial difficulties. China plans to sell 3,000 megawatts of electricity from its dams to Thailand from next year. Thai companies have also invested in nine Mekong dams in Laos. One of those, the Xayaburi hydroelectric dam being developed with Thai construction giant Ch Karnchang Plc, is 56% complete. When finished, about 95% of the power generated by the dam is earmarked for export to Thailand. Pak Beng dam in northern Laos, backed by the Thai private energy company Egco, the state-owned China Datang Cooperation and the Lao government, is undergoing feasibility studies. On Myanmar’s Salween River, Chinese companies and Egat International are jointly developing hydropower projects. Thailand has faced much criticism from the international community since the 2014 coup, but its relationship with China appears to have been strengthened with Gen Prayut meeting Chinese leaders on several occasions. Some analysts interpret this as Hao-han or “good fellow”, a Chinese diplomatic policy to approach isolated nations as a big brother. Last week, Gen Prayut flew to China’s Hainan Island to attend the first Lancang-Mekong Cooperation summit (LMC). A series of Thai-Chinese projects have emerged under Gen Prayut’s administration, including the joint development of a high-speed railway. The Chinese side asked to develop land plots adjoining the route as part of the agreement. However, at the summit last week Thailand said it would be the sole investor in the rail project and hire China as the developer. At the summit, Chinese Premier Li Keqiang, who proposed the LMC framework in 2014, met with the leaders of Thailand, Cambodia, Laos, Myanmar and Vietnam. The meeting was under the title of “Share the River, Share the Future”, focusing on connectivity, industrialisation, border trade, water resource management, agricultural cooperation and poverty reduction. Millions of people living in the lower Mekong countries will benefit from the framework, according to the organisers, with a list of urgent development and infrastructure projects expected to be released. Gen Prayut told the meeting China and other lower Mekong River countries should cooperate on water management for long-term benefits. He reiterated the need for “constructive” cooperation among all countries and touted the idea of a centre for water management. But analysts say China’s recent response to the drought and the LMC meeting are ways for Beijing to bring all Mekong countries to the table to establish its own agenda. Thitinan Pongsudhirak, from the Institute of Security and International Studies at Chulalongkorn University, wrote recently that the LMC concept symbolises China’s shrewd effort to establish its own rules and institution. “For China, blocking off the water for its own benefit and then feigning benevolence in offers to share it with those further downstream yields short-term bargaining chips,” he wrote in the commentary “China’s alarming ‘water diplomacy’ on the Mekong” for the Nikkei Asian Review. Mr Thitinan wrote China’s Mekong manoeuvres are similar to what they are doing in its ongoing “construction and weaponisation” of artificial islands in the South China Sea, where the approach is to “build first, talk later (if talk at all)”. However, in the South China Sea, the Asean maritime states are putting up a united front and are seeking greater commitments from US defence engagement in the area. He predicts China will have its way in mainland Southeast Asia for some time. But he also warns that its “myopic approach of playing by its own rules and disregarding those of other parties may boomerang”. Mr Thitinan argues China’s dam power may ultimately fail if its smaller neighbours gang up against it. The nuances of international diplomacy mean little to Prayun Sean-ae, a 54-year-old Loei farmer and fisherman suffering as a result of China’s recent largesse. Of late, his fish catches have been sparse due, he suspects, to manipulation of the water flow in the Mekong. His reduction in income from fishing has forced him to work a small plantation and riverbank garden to generate farm income to compensate for his losses. Despite drought hitting the lower Mekong on a regular basis, Mr Prayun has always had enough water for farming from seasonal rainfall. But in recent years, his vegetable plots on the riverbank have been flooded by water discharged from the Chinese dams, reducing his harvest. According to a local survey, 34 families who sell produce at Kaeng Khut Khu are losing between 200,000 and 300,000 baht a day if they can’t operate during the high tourist season. There’s no official record of the economic cash flow, but most of it helps keep the local community solvent. The irregular water flow is also a concern for the community in Loei’s Pak Chom district. Locals says they have had difficulties staging Songkran festivities on the Mekong shores in the past five years as water levels have risen unexpectedly overnight and damaged stalls and attractions prepared for the festival. 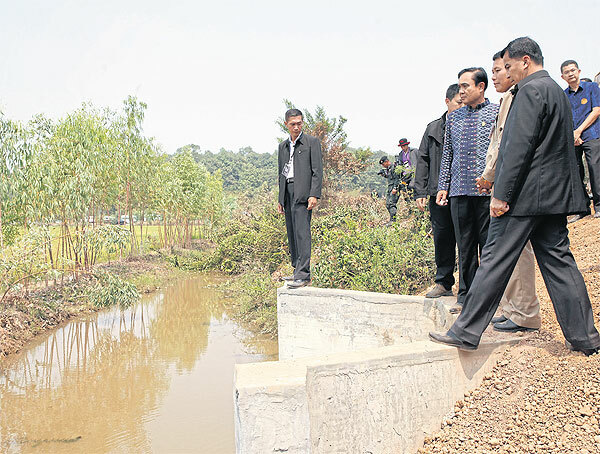 High and dry: Prime Minister Prayut Chan-o-cha tours drought-afflicted Udon Thani earlier this month. The Chinese government claims it released water to ease the drought. 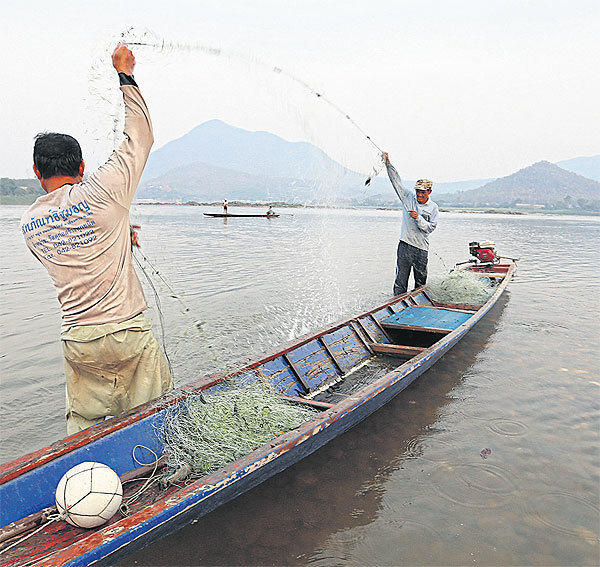 Catching the drift: Fishermen in Chiang Khan say their catch has been diminished by unpredictable water flow in the Mekong River. They blame Chinese dams upstream for releasing large volumes of water, often without giving any notice to those living downriver. Trading flow: A fully laden cargo ship transports goods along the Mekong River to China.